Note the message in the bottom left corner: Restart will be required. Really? Why? What is so friggin' essential about Safari or iPhoto or AirPort Extreme (I'm using a wired connection here) that requires a full reboot of the operating system? This is just developer laziness, or excessive caution. I'm working here. Get it? I'M WORKING HERE! I have multiple windows open, with just the right PDF documents displayed, and all the windows configured correctly. I have the right files open in my developer tools. Even with shortcuts like "Open recent ..." and Firefox's automatic tab re-opening (which Safari makes you do by hand, for some reason), having to restart, and then re-open and re-arrange everything is is a big interruption. Now I understand the concept of the therapeutic reboot ... the reboot just to get the system back to a stable state after it's gotten all weird. But this isn't about that. 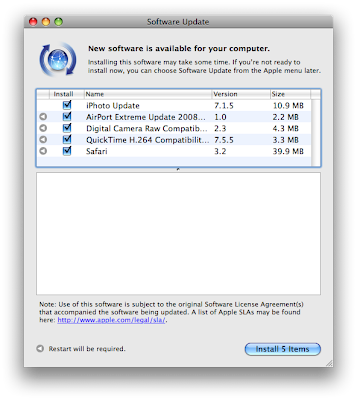 This is just some stupid little software update. So, Software Update, get over yourself, you annoying little twit. Same to you, Windows Update. A lot of the talk surrounding the recent presidential campaign was about judgement. Did Obama's connection with Bill Ayers show bad judgment? Was McCain's selection of Sarah Palin as his running made poor judgment? Actually, everything is about judgement. We use judgement constantly, all day every day. Everything we do voluntarily, from getting out of bed to making business decisions, involves judgement. In fact, the new field of behavioral economics has much to say about how our conscious and unconscious brains collaborate in this decision-making process. The long and short is that our judgement is not always rational, and there are a host of biological and environmental factors that contribute to how we choose. So, given that our judgement is so subjective and fragile, doesn't it make sense to use objective data and criteria when possible? Heck, even baseball now uses instant replay to augment the umpire's decision-making. So shouldn't DNA evidence, where available, be a right of accused and convicted people in criminal cases. I'm sorry. I know I've been remiss. I have to confess that I'm finding it very hard to be curmudgeonly this week. I'm trying. Normally I thrive on cynicism and negativity. But I just can't seem to muster much ex-thusiasm right now. What amazes me most is that my son's generation is not amazed at all. They don't see anything remarkable in our having elected an African American president. Much of the talk surrounding this presidential election has to do with income inequality and the distribution (or re-distribution) of wealth. Both major party campaigns have at least paid lip service to the plight of the middle class. What is the connection, if any, between wealth distribution and a nation's status as a world power? The U.S. came of age as a world power during the so called gilded age, when new industries and a laissez-faire regulatory policy created huge discrepancies in wealth. This lasted until after World War II, when the more egalitarian welfare state took hold. So is inequality a prerequisite for being a world power? And what's wrong with being a former world power anyway? France hasn't been a threat to anyone since the days of Napolean, and that seems like a pretty nice place. Britannia no longer rules the waves, but there's great theater, dining and shopping in London. So maybe it's time to take it easy. [Senator Obama] said the other day that his primary victory 'vindicated his faith in America.' My country has never had anything to prove to me, my friends. I have always had faith in it..."
I guess John McCain has always been a white male. In any case, John McCain told Sean Hannity earlier this year, "I really didn't love America until I was deprived of her company..."